Kathleen Cleaver, who is featured in The Black Panthers: Vanguard of the Revolution, poses for a portrait at Village at the Lift, presented by McDonald’s McCafe, during the 2015 Sundance Film Festival Jan. 25, 2015, in Park City, Utah. One of the central figures in the history of the Black Panther Party is Kathleen Cleaver, the first communications secretary for the organization until 1971, when she went into exile in Algeria with her husband, Eldridge Cleaver. 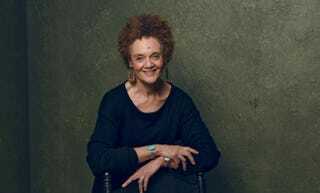 Now 70 years old, Kathleen Cleaver—who is finishing her memoir, Memories of Love and War—is a law professor at Emory University and co-founder of the Human Rights Research Fund. The Root spoke with her about the Panthers, Black Lives Matter and Joanne Chesimard, aka Assata Shakur, the party member who is exiled in Cuba. The Root: Why should people see the documentary Black Panthers: Vanguard of the Revolution? Kathleen Cleaver: It tells the story of the Black Panthers, both its international history and its origins, as well as its conflicts. It can’t, of course, tell every story, but it’s very well-made. I think it’s very significant that you could make a movie about a group of young black people whose organization was destroyed; about 22 of them were killed, mostly by the police. The Black Panthers had a very intense existence at the beginning, until the politics changed and it became a different type of organization. Many people don’t know that, and it covers that; it’s an excellent story. TR: How did you become a Black Panther? KC: In 1967 I was a Student Nonviolent Coordinating Committee worker and invited Eldridge Cleaver to a conference we were holding. That’s where we met and fell in love. He went back to California. After [Panthers co-founder] Huey Newton was shot, [Eldridge] said, “You’ve got to come out here and help me.” That’s because the Black Panther Party structure was pretty much in collapse. So I became involved immediately and took on the role of communications secretary. The rest is history. TR: What are some of your most memorable moments with the Panthers? KC: Just about every other moment is memorable. But I would have to say the most memorable moment was when I was set up to be shot by police in San Francisco. It was August 1972 and I was asked to come to someone’s home with two other Panthers. By the time we got there, the whole basement was filled with police, and I realized it was a setup. The idea was the men that I came with would be armed and there would be a shoot-out. I was supposed to be shot, but it was an incompetent arrangement. TR: Any chance there will be a resurgence of the original Black Panther Party? KC: Some of the conditions that gave rise to the Black Panther Party are not present now, such as the Vietnam War and segregation. The type of political framework of the United States and what types of things are possible in 2015 does not resemble what was possible in 1970. In between, you have what we call the war on terror and 9/11, and a whole host of things pushing the country into a more authoritarian and militaristic structure of government, and a very low level of popular participation in the political process. Or you can participate, but you can’t make any impact. TR: I was in Austin, Texas, in March and saw a small group of self-described Black Panthers marching through town carrying guns. KC: Are these those goddamn fools called New Black Panthers? Because they are not Black Panthers. They are posers, agents and morons, as far as I’m concerned. Most of them don’t know anything about the Black Panther Party, either. TR: One of the more well-known Black Panthers is Joanne Chesimard, who was convicted of killing a New Jersey police officer, broke out of prison and is now in Cuba. There are renewed calls for her extradition. What are your feelings about the situation? KC: She was a Black Panther living underground, who was in a car with other Black Panthers driving through New Jersey. They were stopped by the police. She ended up wounded, another member got away and one died. This is what happened to Panthers in the ’70s. She ended up on trial for killing a New Jersey police officer in an altercation in which she was physically incapable of holding a weapon, but that doesn’t matter in what they call the kangaroo court. Many people were concerned that she would not be able to stay alive in prison after being convicted of killing a cop. An escape was planned; it was successful. To live in exile, I assure you, is not a happy situation. I’m glad that she’s alive and secure, but none of this gives us cause for happiness. It’s proof of her intense commitment to remain alive and to continue to struggle. TR: A lot of comparisons have been made between the Black Panther Party and Black Lives Matter. KC: Let’s get one thing straight: The Black Panthers was not a movement. The Black Panther Party for Self-Defense was an organization created Oct. 21, 1966, with a 10-point platform of what we wanted, what we believed. It was [at] the time when organizations such as SNCC, the NAACP and CORE were in the forefront of the black struggle. So there was a civil rights movement, but it was generated through organizations. TR: So what do you think of Black Lives Matter? KC: I’m thrilled to see such concern for the community. I think Black Lives Matter is exhilarating, exciting, and I’m really glad that it’s here.